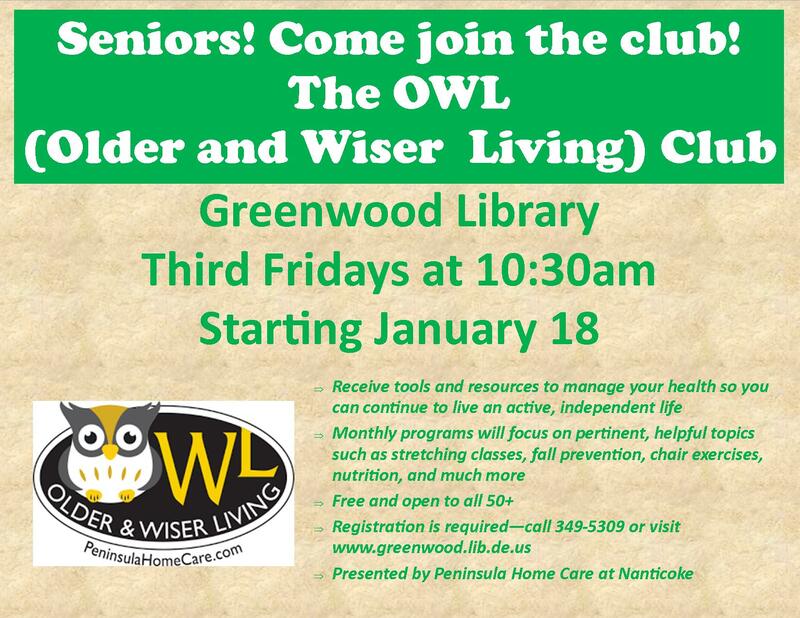 On the third Friday of every month, at 10:30am at the Greenwood Library, Peninsula Home Care will hold meetings of the OWL (Older and Wiser Living) Club with programs with topics of interest to seniors 50+. Membership in the OWL Club is free and provides seniors with tools and resources that allow them to work in partnership with their healthcare team to prevent and manage challenges today and down the road. Possible topics for the monthly programs include stretching classes, fall prevention, hydration, nutrition, and much more. The programs are free and open to all, and registration is required. To register, or for further information, please contact the library at 349-5309 click below to register for specific dates.